The copper redhorse can only be found in one place in the world — swimming in the waterways of southwest Quebec. It was officially listed as an endangered species in 2007 and is protected by Canada's Species at Risk Act. This robust fish, with its large, copper-coloured scales that inspired its name, is a solitary migrator. In spring, adult fish swim upstream to the Richelieu River to reach the only two known spawning grounds for the copper redhorse: in the Chambly Rapids and below the Saint-Ours dam. The Nature Conservancy of Canada (NCC) actively participates in the protection of these areas by conserving the islands and riverbanks of the Refuge faunique Pierre-Étienne-Fortin (wildlife refuge). NCC has also protected 15 kilometres of riverbed in the Richelieu River, which represents 12 per cent of its area. 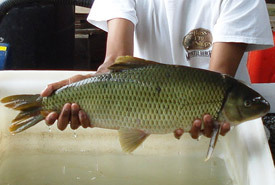 Since most adults quickly leave the spawning grounds to return to their feeding grounds, the eggs and young copper redhorse are not protected by their parents. Once hatched, the fry (or larval fish) find refuge and food in the grass beds located in the Île Jeannotte and Île aux Cerfs archipelago, which are also protected by NCC. These two properties, which form an archipelago of more than 70 acres (30 hectares), are the two last islands of the Richelieu River to be uninhabited. This area is an important habitat to the survival of young copper redhorse. NCC actively works in close collaboration with the copper redhorse recovery team and the ministère de l’Environnement et de la Lutte au changements climatiques (MELCC). A key threat to this species’ survival is the deterioration and loss of habitat. To remedy the situation, NCC has recently undertaken several stewardship activities, in addition to making important property acquisitions. In addition to these conservation activities, NCC launched a campaign to renaturalize the riverbanks in 2006, after having surveyed the banks and meeting with several landowners along the Richelieu River. This campaign is still running strong, and NCC continues to meet with citizens and encourages them to undertake maintenance work on their property. In the years to come, this project will also extend to the Île Jeannotte and Île aux Cerfs archipelago in order to improve the state of their shores and the water quality of the Richelieu River — both priority actions for the protection of the copper redhorse and seven other endangered fish species. Since the survival of the copper redhorse also relies on public education, NCC and our partners have installed interpretive panels and marker buoys to inform the community about how to protect this species and to encourage good practices when navigating the waters and pathways. “The copper redhorse is the standard-bearer for biodiversity in Quebec. There are between several hundred and several thousand left, and it is our responsibility to protect them,” explained Nathalie Vachon, MELCC biologist and a partner of NCC in the protection and recovery of this species. NCC launched an artificial reproduction plan in 2004. Each year, adult fish are intercepted while migrating. Fertilization takes place on-site and the young are raised in the Baldwin-Coaticook hatchery, which is located in the Estrie region. The fish are then released into the Richelieu River in July and September. Since 2004, approximately three million fry and 168,000 young fish have been stocked in the archipelago. However, due to natural mortality rates, only a fraction have reached full adulthood. “We are working hard to help natural reproduction rates of the copper redhorse so that they may one day reach adequate levels to renew fish stocks and ensure the long-term survival of this unique Quebec species,” says Nathalie.